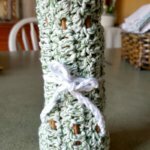 I had a request for my Super Simple Baobab Water recipe during my An E-a-Day Challenge the first week of January, so here it is! 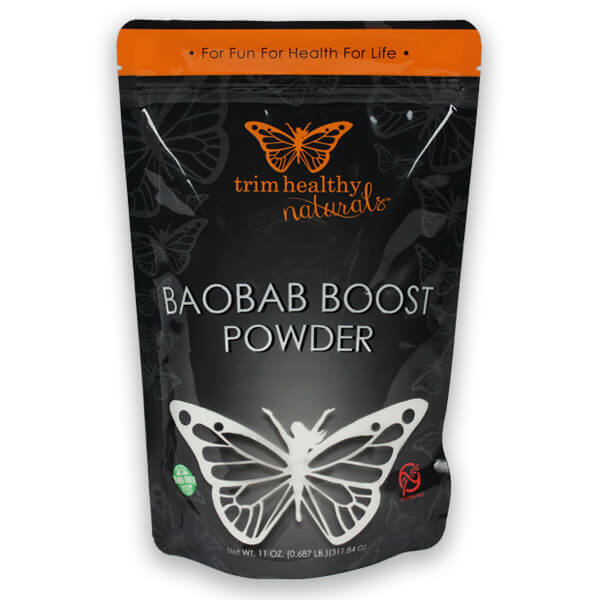 Baobab powder is a wonderful superfood ingredient to add to your foods. 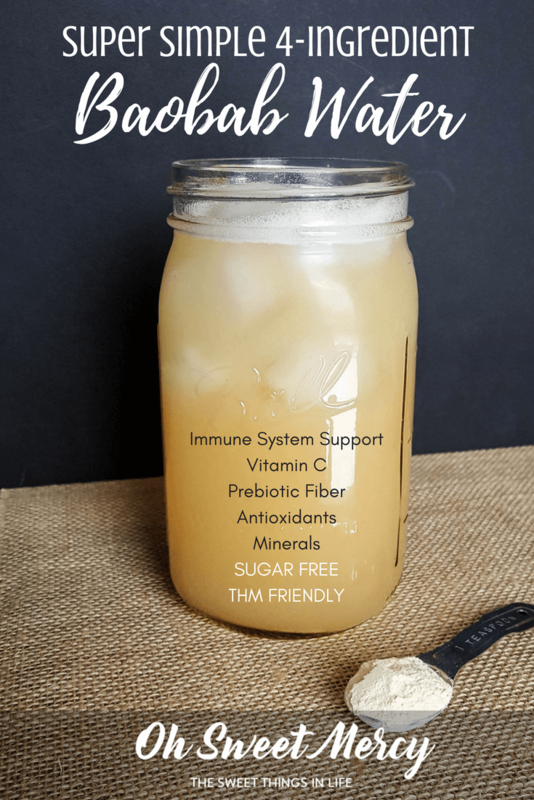 Making this simple baobab water is a great way to get the immune-supporting goodness of baobab into your day (especially during cold and flu season). I do my best to make things you ask for (Kari I have not forgotten about your request, it’s just taking some time!) and post them on the blog. Sometimes recipes don’t turn out right and I have to keep trying. Other times, I nail it right away. You just never know how a recipe is going to go until you’re in the middle of it. There are also times where you think a recipe is going to be a winner. Then you get to the finished product and blech. Not a winner at all. This is our sweet Hendini, who perished in a tragic coop fire 2 years ago. If you’d like to read the sad tale, and what I learned from it, you can in Keeping Chickens – When Tragedy Strikes. 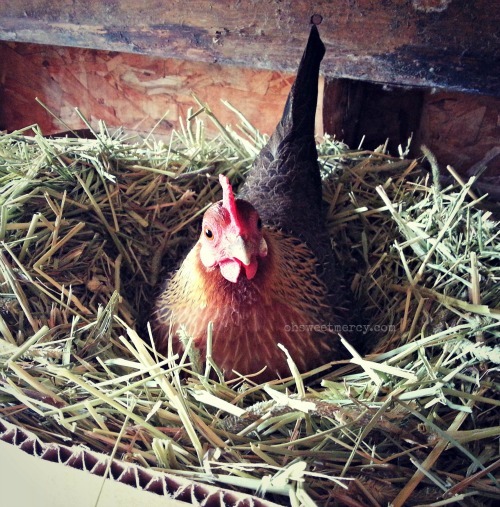 I still miss you, you sassy little hen. This Super Simple 4-Ingredient Baobab Water Is A Winner. I started making it last year after I saw someone comment that they put 2 tablespoons in some water and couldn’t choke it down. Because apparently that was a challenge in my mind. You guys, I seriously crave this stuff. At least 2 big not-Yeti insulated cups full of it nearly every day is not uncommon. Unless I wake up and realize I’ve moved to Antarctica overnight and all I want is hot drinks. Good news though, I have a Hot Creamsicle Cocoa recipe so I can still have my baobab even when it’s freezing cold! You could also have a Cranberry Orange Baobab Muffin with it, too. Baobab is so versatile! Honestly I’d never thought of putting it on the blog because it’s just so simple, it hardly seems to be much of a recipe. But since you asked so nicely, I’ll tell you how I make this yummy stuff. There is a recipe floating around that includes lemon juice, I haven’t tried it personally. I’m sure it’s delish! I just love this and stick with it because it’s just so easy (and that’s one less ingredient 😉 ). “Boost Juice” is another baobab drink recipe going viral in the Trim Healthy Mama Facebook groups right now but I haven’t checked it out yet. This simple recipe does it for me so I guess I’m not looking for a replacement! Let’s Make Some Baobab Water (And Support Our Immune System)! Baobab is chock full of goodness. High in Vitamin C, minerals such as calcium, iron, and magnesium, as well as prebiotic fibers, it’s a great addition to your daily routine. If you are adding fermented things to your diet, such as kefir (in my Refreshing Peach Mango Kefir Smoothie, perhaps) or this zippy Raw Fermented Hot Pepper Sauce, it will give those good probiotic critters a helping hand. If you’re just starting out with the baobab, take it easy at first. Some people have reported becoming extra gassy when they first start using it, especially if they’ve had too much in one day. How much is too much? That probably depends on YOUR body. I think the first day I made baobab water, I had like 3 of them. That was definitely too much. Now, I have 2 or sometimes 3 a day with no problems. Don’t let the prospect of baobab water making you gassy keep you from trying it though. It really is a great way to boost your body! 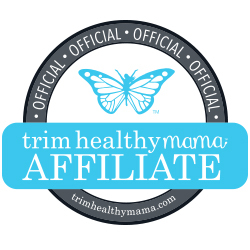 My favorite is the THM Baobab Boost Powder, but you can also find this brand at my affiliate partner, Amazon, or also at your local Wal-Mart. If you’re looking online or in a health food store, be sure your baobab powder contains only baobab! Have You Tried Baobab Yet? This Super Simple Baobab Water has just 4 healthy ingredients! Quick and easy to mix up and enjoy any time of day. Baobab is a great source of Vitamin C, calcium, iron, magnesium, and prebiotic fiber to help keep you healthy, especially during cold and flu season. In a mason jar, or sufficiently large drinking vessel, add all the ingredients. Use a small wire whisk or frother to mix well. Sip and enjoy the lovely, light, citrusy flavor of your healthy Baobab water. Since there is no significant source of fuel here, this is an all-day sipper. If you can make it last that long, that is! This means you can have it any time, with any meal, or between meals. 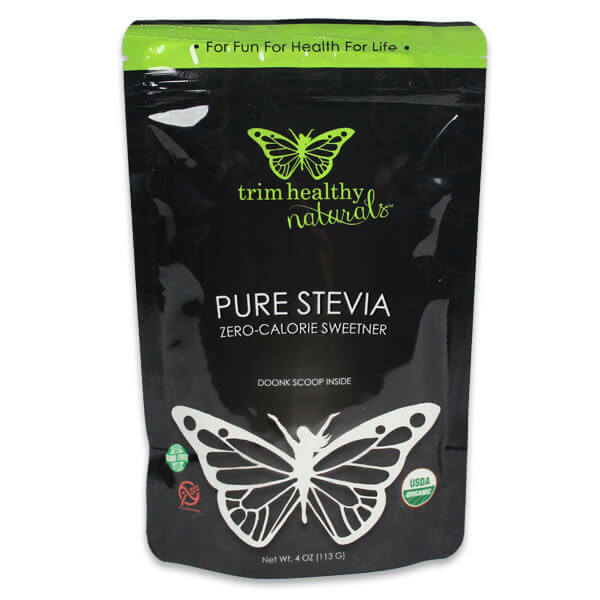 I have not tried with any other sweeteners as I prefer to use the pure stevia extract for drinks like this. If you want to use Gentle Sweet or another on plan sweetener, add a little at a time and taste until it's as sweet as you like it. The baobab will settle out if the drink sits undisturbed for a while, this is normal. Just give it a good swirl to mix it back up before drinking it again. Pin This Super Simple Baobab Water Recipe So Your Friends See It Too! Hi Dawn! 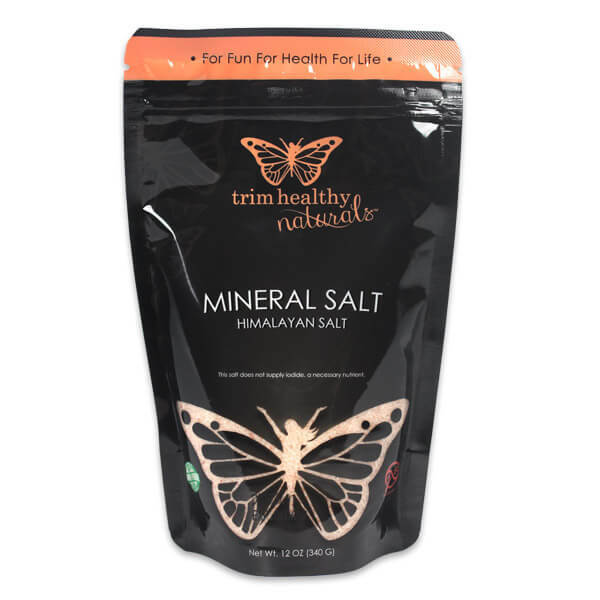 I plan to try this today, but I’m really curious what made you add the salt? I just never think to add it to my GGMS (which I add baobab to now) or water, so just curious. Thanks for sharing the recipe! Thank you for this. I ordered the powder hoping it would work in my daily water. So this gives me a starting point. I hope you like it as well as I do. 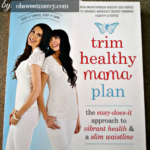 It’s a great way to stay hydrated and I know it will be perfect for the hot summer months too. I should check out that recipe lol, I haven’t yet because I just love this so much. 1 teaspoon keeps it more economical though if that’s ever a concern for you! Hope you like it, let me know what you think with the lemon. Tried this this morning and I love it. Thank you. Oh great! I’m so glad you do! Thanks for coming back and letting me know, I really appreciate it! 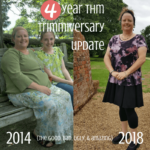 I have been making the hello health sipper in the Thm cookbook. (Yes the one with 13 ingredients!) Do you think it’s ok to drink this on the S days of a fuel cycle? 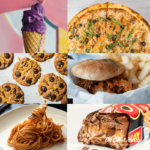 It does have some carbs in it. Just wondering. I haven’t tried the Hello Health Sipper yet (mostly because of 13 ingredients LOL but it looks beautiful). I’m not quite sure I understand your question – are you asking if it’s ok to drink the Hello Health sipper on S days of a fuel cycle or asking if my Baobab Water is ok? S days during a fuel cylce, even a Deep S, do have a minimal amount of carbs that are naturally present in vegetables. We don’t count the carbs in non-starchies (one cup of spinach, for example, has 1.09 g carbs and .7 g fiber, so a big salad of 3 cups of spinach would have just over 1g carbs). Hope that’s helpful, thanks for stopping by! I love the “Boost Juice” with the lemon. But, sometimes I run out of the lemon. So this recipe will be lovely to have on hand. I’m going to give this a try tomorrow. I know I’ll love it. Thanks so much for the recipe. I add lemon and ginger to mine. Is that okay? Hi Shawanda! That sounds delicious and won’t do anything but add nutritional benefits to your drink so go for it. Thanks for stopping by! What do you think it would taste like added to the good girl moonshine? Hi Star! I think it would be delicious myself. I’ve seen a lot of THMs in the FB groups saying they add it to their GGMS. It has a light, citrus-y flavor much like orange sherbet. I have not felt like drinking GGMS for AGES so I haven’t tried it yet. Maybe I will tomorrow, thanks for the inspiration! Hi Dawn thanks for this. I have the Baobab and couldn’t decide what to do with it.. 4 ingredients.. yeahh I can do that. Mix all of that together really well and pour into quart size jar. Add a scoop or two of ice and fill with water. Delicious. I’ve actually been doubling this into a 1/2 gal jar and drinking it through the day and sometimes into the next day. A couple pinches of salt would be great with this. Sounds delicious! One thing to consider too is with that amount of collagen you don’t have a “sipper” anymore so if you notice a stall you might want to cut back on it. But it sure sounds refreshing and delicious! And I’m sure a pinch or two of salt would be great. Thanks for sharing! Hi Erika! My Babobab Water does not contain ACV (apple cider vinegar) so you can use any kind of straw. Oh sure Yeti and other insulated cups are fine. There’s nothing that will react in this as far as I know. I used a mason jar because you need to be able to see the drink in a photo for one, and for two many THMs use mason jars for their sippers. I have a Beast brand insulated cup that I use for my baobab water and love it. One thing about big insulated cups like this I learned the hard way – they can apparently cause tendonitis in your arm from having to extend your hand so wide to pick them up. I developed tendonitis in my arm after I started using a big insulated cup like a Yeti (over the course of almost a year) and made no connection to the cup. Several months ago I mentioned my arm hurting to someone I work with and they said their dad and someone in their church got tendonitis from using their cups. I ordered a new cup with a handle and immediately (from stopping using the cup I had until I got the one with the handle) noticed a difference. It took several weeks for the pain to completely go away but it’s now gone. I have small hands so it was really overextending my grip to pick that cup up and I did it many, many times each day.